Instead of diligently blogging every morning as I thought I might and catching up on the ludicrous number of unread posts in my Google reader, I decided to stop and take a look around. I went on some architecture tours. I went to the zoo. I stood at the top of the Sears Tower, leaning my head on the glass just like they do in Ferris Beuller. I discovered the unknown pleasures of Filene’s Basement. I smiled at the Tribune Tower every morning. I said goodnight to the Sears Tower from our apartment every night. I met the very lovely Courtney and made a friend for life. I spent a happy fifteen minutes in the same room as the painting I have loved since 1995. I stood, entranced, by the Bean (officially, the Cloud Gate) every day. Man, I love that thing. I think I may miss it more than I miss Nick, who is still in Chicago. But as Ferris said, life moves pretty fast, and while my attention was diverted, the deadline for an event that I had diligently planned to participate in slipped past. Mea culpa! Julia of A Slice of Cherry Pie (who I recently met) and Scott of Real Epicurean host a monthly seasonal event called In The Bag, and the September theme was seasonal fruit and nuts. Somehow I have never managed to participate, and now I am beginning to think I’m cursed 🙁 Anyway, it’s the thought that counts, right? Next time, guys… In the meantime, I will instead submit this recipe to Ruth’s Bookmarked Recipes event. I found this torte on the rather delicious Elra’s Baking. The lovely Elra hails from Bali but is married to… a South African, which is how we got chatting one day. She is an extremely accomplished baker and her site is a veritable treasure trove of interesting bread recipes and decadent cakes. 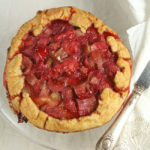 Visit once and I guarantee you you’ll be back again and again for all the recipes you bookmark! b) leaving the house with the poor torte in its pan in a bag less than 30 minutes after it came out of the oven. Like the cheesecake I baked last year, I think the idea is to let it cool completely in the oven before serving, not taking it on a trans-London dash still hot and wobbly… Clearly I never learn. So the centre was a little gooier than I’d planned for, and the lighting at the friend’s house where the torte was served for dessert was very dim – both of which made for some resoundingly unappetising photos of the served torte. So feast your eyes instead on the fresh blackberries, and the egg mixture being stirred into the chocolate (decadence has a new name!!). And then print the recipe and go and make it immediately! It’s very rich and very decadent but gluten free, which is a bonus, and I’m sure it would work as well with defrosted frozen berries as with fresh ones. In a dry frying pan, lightly toast the slivered almonds (watch them as they burn easily) and set aside. In a food processor, process the ground almonds and icing sugar together to form a fine almond flour. Set aside. Grease a 22cm springform pan and line with baking parchment. Pre-heat the oven to 180C. Melt the chocolate and butter together in a heatproof bowl over a pot of simmering water until almost completely melted. Remove from the heat, add the orange zest and liqueur and stir until smooth. Whisk together the egg yolks and 1/4 cup sugar until thick and pale yellow. Stir the egg mixture into the chocolate mixture and set aside. In a clean bowl and with a clean whisk, beat the egg whites, salt and cream of tartar until foamy. Gradually add the sugar and continue beating until the egg whites form soft peaks. Take about a quarter of the egg white mixture and mix it into the chocolate mixture. Add the almond flour and fold it in well. Add the rest of the egg whites to the chocolate and fold until just incorporated. Pour the batter into the prepared springform tin. Arrange blackberries on top. (They will sink in – don’t worry, they’re meant to!). Sprinkle toasted almonds on top and bake in the middle of the oven for 25-35 minutes. Torte is ready when a skewer comes in clean when inserted near the edge, but the centre is still visibly wobbly. Allow to cool completely in tin before removing and cutting. OK. I’m your first comment. I’m so happy you enjoyed our fair city. I know we will meet again soon. As for that torte, all the flavors are great. You cant hurry baking process like food. Patience, but it all looks great to me so I dont know what your complaining about. Goodness, I love this torte. I have made this in summer, but mine was much simpler than yours. It is my favorite from all of the torte out there. And by the way, I love mine gooey in the center, honestly! I forgot to mention how happy I am that you tried my recipe. I’m glad you enjoyed it! How indulgent is that Jeanne! WOW…it’s enviable actually…DROOL! This is my kind of cake. I like that it is low on flour. I will bookmark it for future use! I’m definitely bookmarking this to try when our youngberries are in season – looks delicious. There’s no way I’ll find a blackberry liqueur in Malmesbury though – would brandy or sherry work, I wonder – definitely not so elegant but alcoholic! I’d better check the archived posts from your site. Ciao! I have had these traveling with hot cakes experience……disastrous to say the least… It looks delicious nevertheless. Those are ingredients I absolutely love! And what a gorgeous dessert they make! oh, and you’ve referred to one of my favorite movies. Mmmm… this looks so good, Jeanne! Love the crunchy, toasted almonds on top and the gloriously decadent swirly batter. Looks good – and I’m so glad you had a good time while you were in Chicago. Next time…I’ll be waiting! I’m not a lover of cake but that looks Good! Great pictures as always. I really doooo need camera lessons! 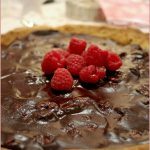 How Creative… Go Cook Sister… .Go Cook Sister… I can not wait to try your chocolate,blackberry almond Torte… The pictures look so wonderful…thank you for sharing..
Looks so rich and almost fudge-like. Yum. I remember Ferris Beuller!!! Gosh are we that old? Ha who cares at least we can appreciate such decadence without guilt. Jeanne this is superb! Your torte looks fabulous! So tempting, it looks so moist and yummy.